Try this challenging bubbles shooter game to train your concentration. It's Bubble Tanks 2! 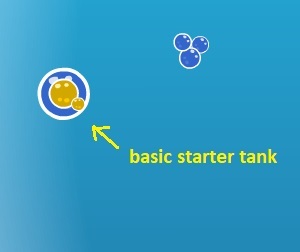 In this game, you start with a tiny bubble tank. 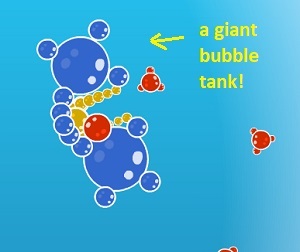 Defeat bubble enemies and grow your tank in size and power. After the game loads, click the Click to Play button to begin. This loads the Bubble Tanks 2 main screen. To start playing, click the triangle-shaped start button. For other options, see below. If you like Bubble Tanks 2, you might enjoy the other free bubble flash games on this site, such as Bubble Trouble and Bubble Hit. HOW TO PLAY. Use the WASD keys to move your bubble tank. Use your mouse to aim. Hold the left mouse button down to shoot. Press the Spacebar for second fire. Destroy enemy bubble tanks by shooting them. Steal their bubbles and grow! 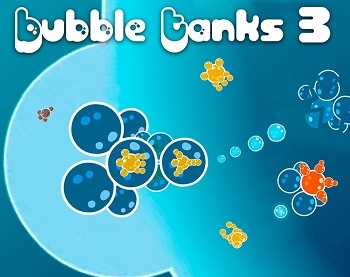 The more you play this bubble shooter game, the bigger and more powerful your bubble tank can become. Receiving damage from enemy weapons will weaken your tank. If you are hit and you have no bubbles collected, you'll be automatically ejected to the safest adjacent bubble field. Sometimes the best course is to simply run! The overall battlefield consists of individual bubble fields. Each of these is a different level of difficulty. To move from one bubble field to another, simply press the WASD keys until you move from one big bubble to another. The farther away you go from your starting bubble field, the harder the enemies become. PAUSE. Press the P key to pause the bubble game. This opens the Game Paused screen. On the pause screen are three useful tabs - Stats, Map, and Options. Stats tab - displays stats including your current tank, primary weapon, enemies killed, and bubbles collected. Map tab - shows a diagram of the bubble fields you have visited. Options tab - same as the Settings screen (see below). BUBBLE-O-PEDIA. This bubbles shooter game includes a handy encyclopedia of the various bubble tank enemies you may encounter. I believe these are also the types of bubble tanks you can build for yourself. To view this "bubble-o-pedia", click the lower-case "b" button on the Main Screen. Types of bubble tanks you can run into include and/or build include Tiny Guy, Little Guy, Dead Head 3, Dead Head 4, Bubble Ball, Life Carrier, B Fighter, L Fighter, S Fighter, Swarm Fighter, Wing Fighter, Twin, Heavy Fighter, Orbital Seeker Fighter, Bubble Bomber, Big Gun, Beatle Tank, Tank Killer, and many more! SETTINGS. To adjust various settings for this bubble tanks game, click the Settings button on the Bubble Tanks 2 main screen. The Settings button looks like two gears. This opens the Settings screen where you can change the graphics, sound, and keyboard settings for the game. Settings you can change include Graphics quality (Low, Medium, or High); Music (On or Off); and Sounds (On or Off). To change the keyboard mapping for this bubble game, click the Keyboard Controls button on the Settings screen. The default key commands are WASD for movement, left mouse button for Main Fire, Spacebar for 2nd Fire, and P to pause the game. Each of the keyboard commands, except Main Fire, can be remapped to a different key as desired. Note: The Pause screen has a map of the bubble battlefield and other useful information. Concentration games like this Bubble Tanks game train important brain skills including focus, concentration, and attention span. Play games like this one often to give your brain a boost! Game distributed by ArmorGames.com. Used with Permission.